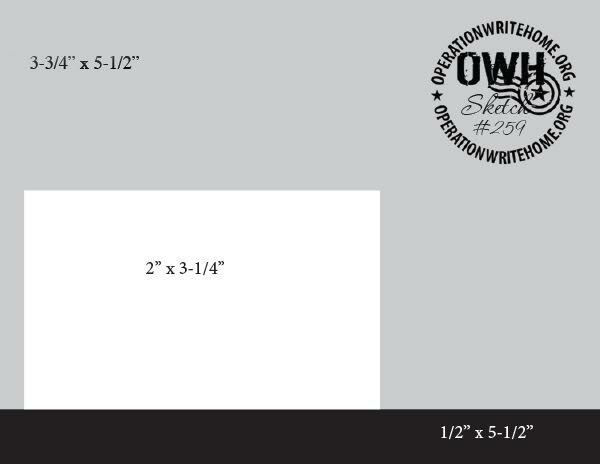 The last sketch (forever) from Operation Write Home was published back in July. Even though I did not make a card from it to sent to them (it came out after my last box was mailed in) I did commit to completing my self-challenge of using every single one of the sketches so I did nake a card to keep in my own stash to be used when an occasion arises. Pretty plain, which always means there is lots of opportunity for interpretation. I remembered having some fancy-edged diecut rectangles and squares so went searching for one that was close to the specified size. This one had to have one edge cut to get it down to the right shape even though the scalloped edgeextends it beyond the measurements given. 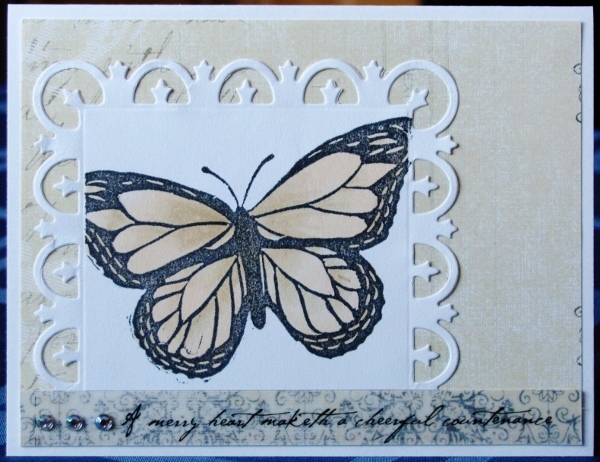 I masked the scallops and stamped my hand-carved butterfly onto the white background. I chose a neutral backing paper with some subtle text on it. One edge (from a 6x6 sheet) had a scrollwork pattern so I trimmed it away to use as the band across the bottom. I had the text printed on a vellum strip and secured it to the scrollwork. The skewing off to the right needed a bit of balance which called for the rhinestones on the left end. I used alcohol markers to color the butterfly to match the background. 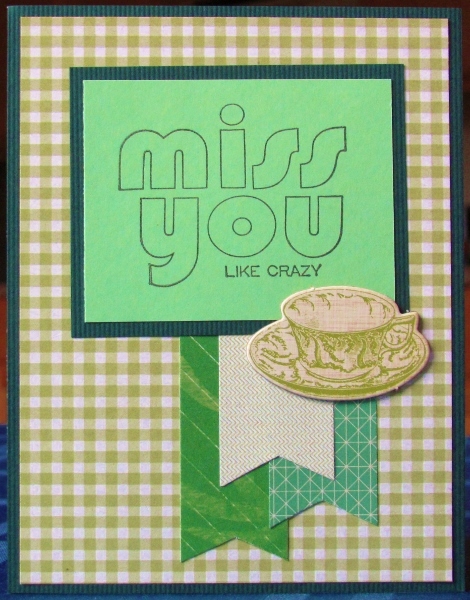 I trommed down the entire piece to leave a white border showing from the card base. So, now that that challenge is fulfilled, what shall be the next? 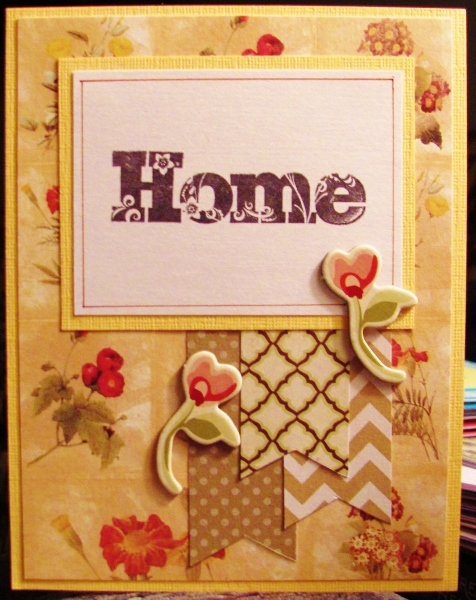 Again, I used a sentiment stamped on white leaving all the options for other elements open. I started with brown flags and then found this great 'label' paper in the 'vintage' divider of my papers. I thought that looked kind of homey. I noted a greenish tinge in the background so I selected some light sage for the bordering elements. 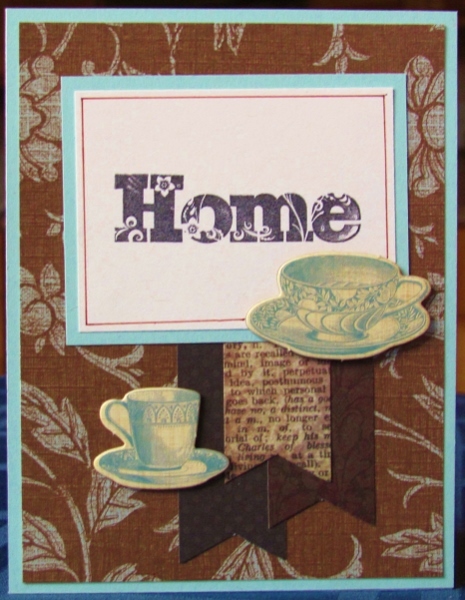 However, I used brown for the drawn border around the sentiment panel. I reinforced the green with the use of a chipboard teacup element. Now that this project is all done, what's on tap for tomorrow? 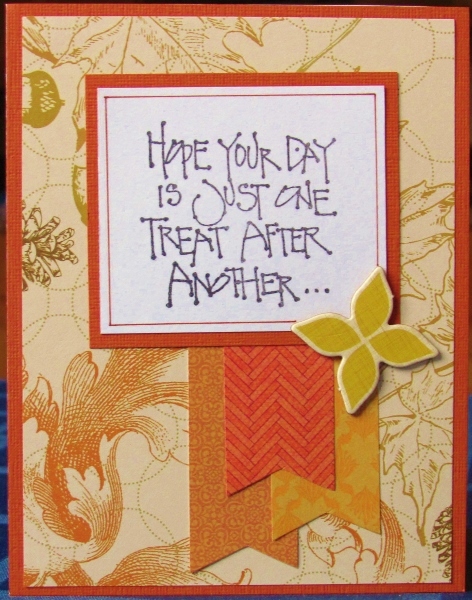 A panel of botanicals and some neutral flag prints lend a restful feeling to this card. The feel of those botanicals are echoed in the florals embelled in the text font. Buttery yellow bordering is low-contrast for the elements so the sentiment needed that bordering line drawn in. The lattice-look flag makes a good foil for the two chipboard rosebud elements. I used what is probably my favorite color combination ever - light blue and chocolate brown. Did you know that these are actually complementary colors because borwn is really dark orange? But in these values you do not get the stark contrast that you do on the color wheel with true blue and true orange. As justification for my color palette I give you the printed background. I added flags in the dark brown and bordering in the pale blue. Then I selected two blue teacups to go with the 'homey' sentiment. 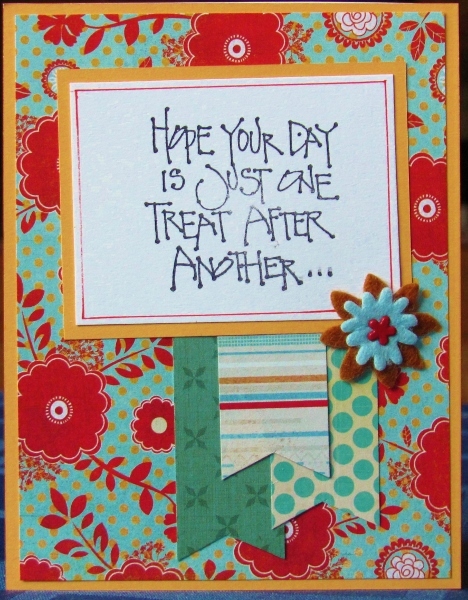 The brown drawn border on the sentiment ties it back to the background. White panel sentiment means a wide open door. I first chose pink flags and then found the gradated background with pink and yellow. That set me on the path to selecting yellow for the bordering and also dictaated which end was 'up' on the background so the elements would have the best contrast. I drew in that border with a marker again, using Distress marker. The chipboard embellishment actually IS a little 'treat' as it is a dish of ice cream sundae. I've been holding on to a stack of this leaf-print background for a long time. I have plenty of it, too. Time to get some use from it. I chose golds and oranges from the background to inform the flags and the bordering. The golden chipboard element can pretend that it is a set of leaves, too. This white sentiment panel also got a marker-drawn border. Are you sick of this sketch yet? Just a few more to go! 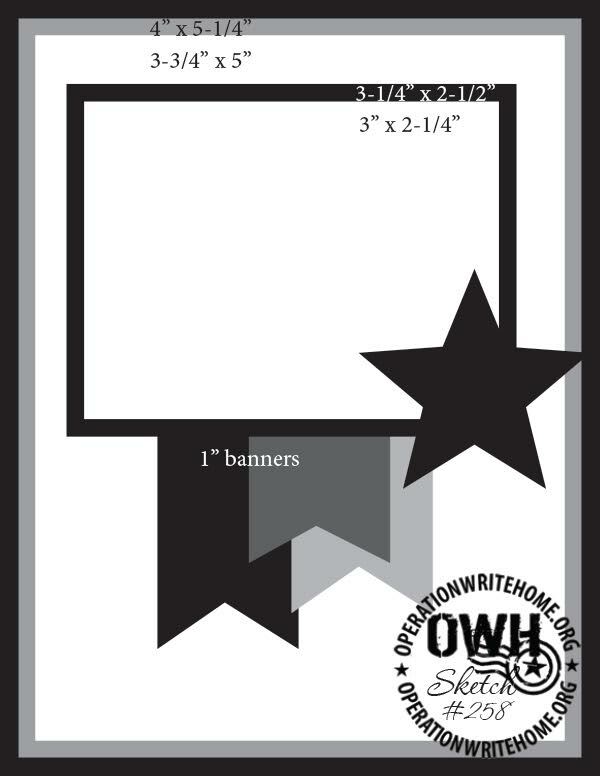 With a white sentiment panel I had all my options open for designing this one. I started with the three mostly-teal flags and when I found this red and teal background print I knew it would tie together with the single red line on the front flag. I decided to pull the golden color from the background paper's dots for the bordering and realized that that front flag also has a golden line. SWEET! I went to a different pile fo embellishements for this card, selecting a couple of felt flowers and stacking them together with a flower brad. The colors are similar but not matchy-matchy. 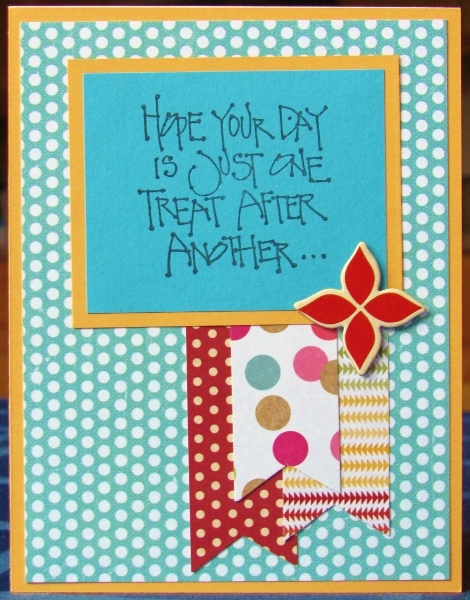 The sentiment panel was a little stark so I used a distress marker to add a bordering line. A bold teal sentiment panel called for other bold colors. I chose a red dot, a multi-dot and a multi-chevron for the flags and then tried a less bright teal dot for the background. With all that brightness the bordering needed to be more subdued. I chose a buttery color from the chevron tag to use. The red chipboard element echoes the color from the red dot, providing some continuity. 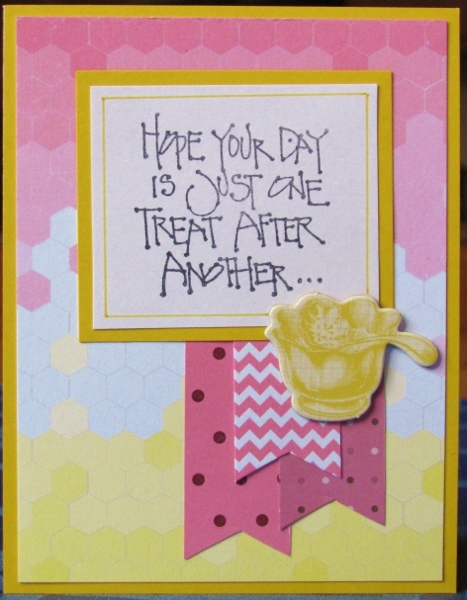 I switched to a new sentiment for the feature and the first one I picked up to work with was stamped on yellow. I didn't want to get al matchy-matchy with the color so I chose a background with a more golden yellow rosebud print. Greens were chosen for the flags and borders as this was also on the background. Those greens are showing too far on the blue scale, though. And, look, I found the round chipboard element that matches the paper! Well, it's not THAT special, but I hadn't up to now used any coloring on these cards. This white panel with a plain sentiment was just too plain so I colored in alternate letters with distress markers, to match the bordering and one of the flags. I love the bordering that picks up the color of the dots in the background. Neat how that round chipboard element has exactly the right colors. 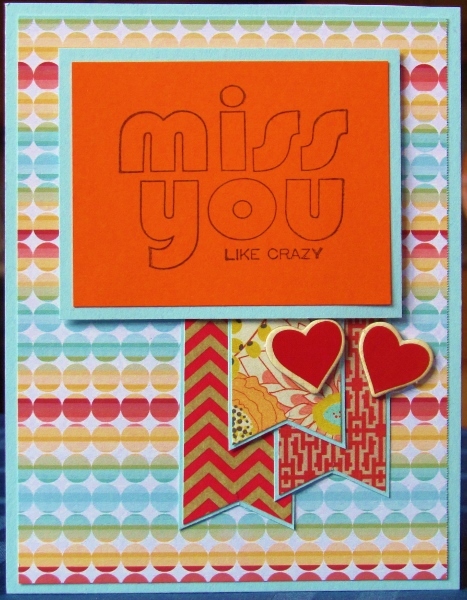 If you think today's card looks familiar it's probably because it uses the same (orange) sentiment panel, the same flags and the same red heart chipboard sticker. The bordering is changed from teal to a grayed green and, the biggest change, there are bold diagonal stripes rocking the background. So much energy in this card! 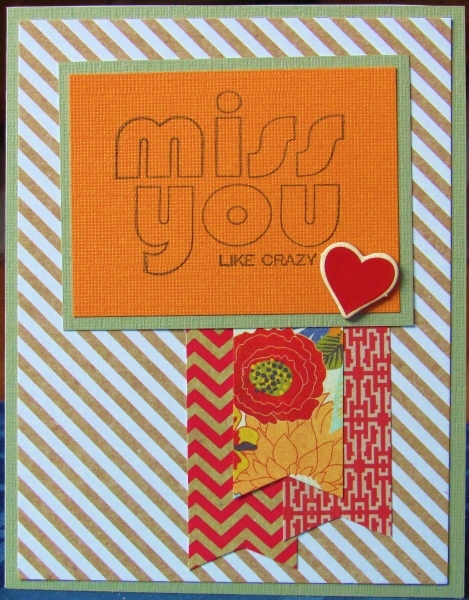 That questioning moment came when I found TWO sentiments stamped on bright orange. REALLY! That's hard to work with. So I basically ignored the color of the sentiment and went with contrast - light teal, red and a dark yellow. The only other touch of orange is in the foremost flag and it is a much lighter, softer tone. Maybe it just speaks to the 'crazy' in the sentiment! Working our way through the rainbow? That's what it felt like when I got to 'green' after pink, blue, yellow, etc. I don't do much green. Al the sentiment was already stamped on green I really pulled out all the stops to keep this on that same track. The hardest part was getting greens that werent too yellow or too blue. That gingham background is another thing I don't use too much. But on this, I think it looks good. I used a very dark green for the bordering since all the other elements were so close in value. Greens are not rendered very true by my camera as these all match much better than shown. You'll notice - if you haven't already - that I dropped one layer out of the sketch on all of the cards, giving them a single border instead of a double one. I decided to do one more with a vellum sentiment and backed this one with a printed pink paper. I have several sheets of this bird printed cardstock but never found a good use for it up to now. The elements of this sketch cover enough of the birds that they cease to be identifiable as such. Then it becomes just a pink floral. I liked that pink and used it in the flags and the bordering. 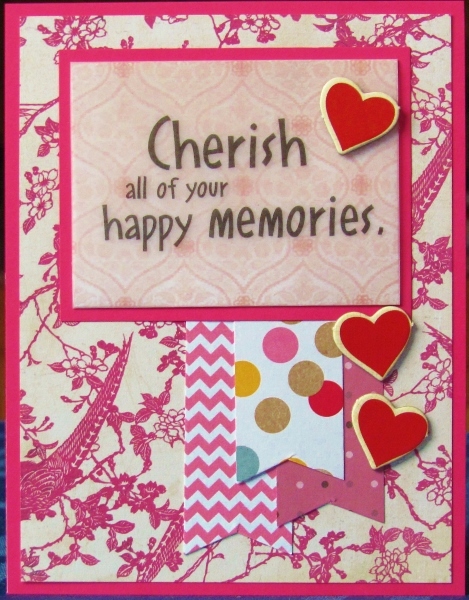 I selected red chipboard hearts for the embellishments that tie in with that one red dot on the front flag. 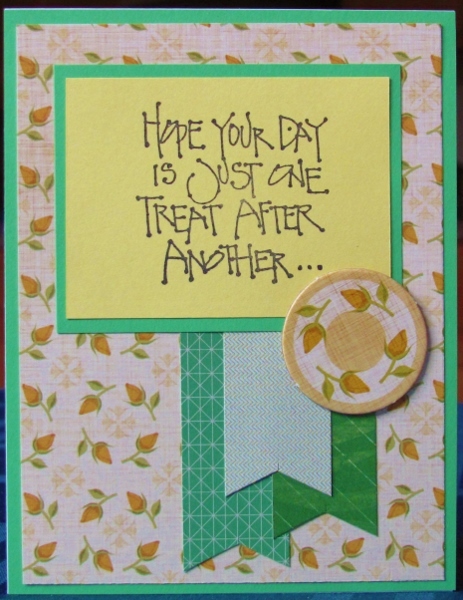 I liked the look of the vellum used for yesterday's card so I sought out another sentiment printed on it. 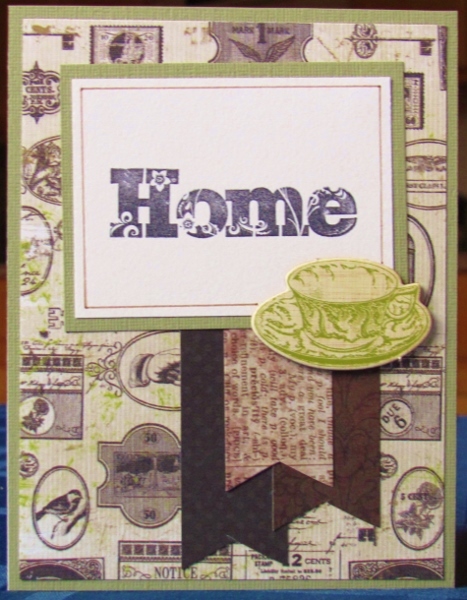 This one I backed with a printed teal paper. The yellow flags I chose seemed rather random until I found a backing paper with dusky teal and yellow. SCORE! The bordering color is a buttery yellow-gold, picked up from the flowers on the paper. The teacup embellishment goes back to the more yellow color of the flag papers on the right side. 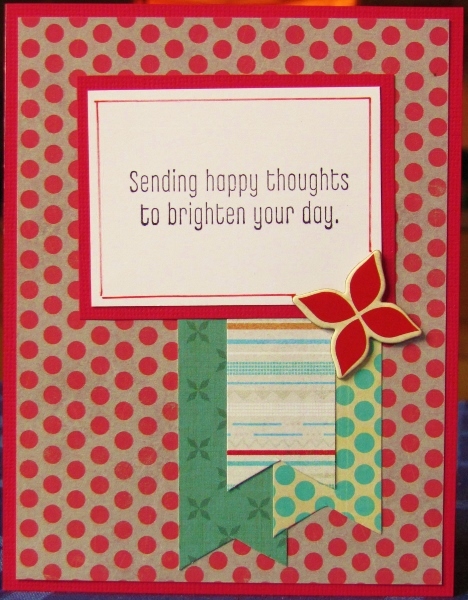 The card today uses the same border color and the same embellishment and one of the same flag papers. So why does it look so different? 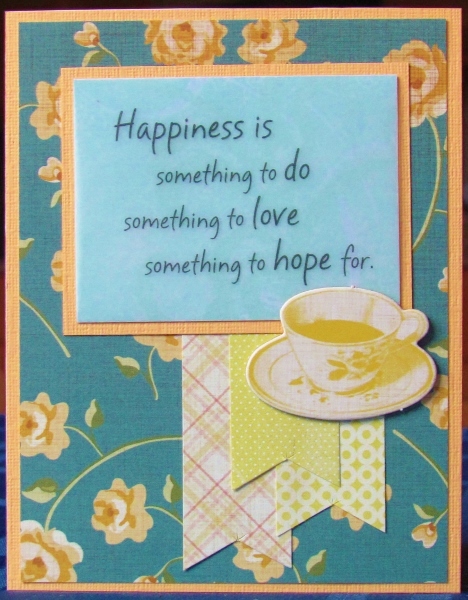 I started with a sentiment printed on vellum and backed it with a lace print paper. This immediately changed the feeling of the card. 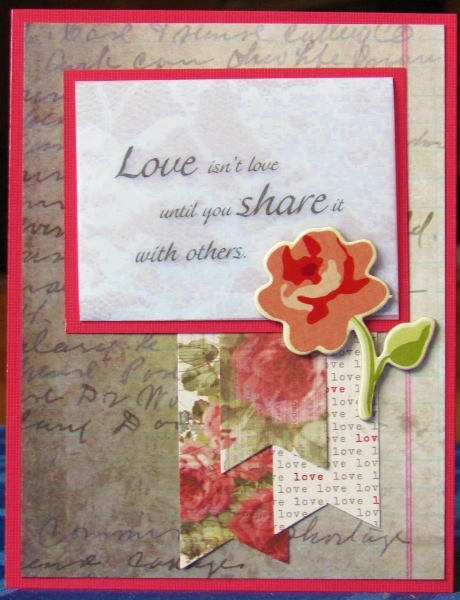 Add to this the use of flags with printed roses and a subtle script backing paper and you end up with a vintage look. That embellishment color is not true in the photo as it is much closer to a true pink than shown. I tried to create a mix of simple and complex looks using this sketch. 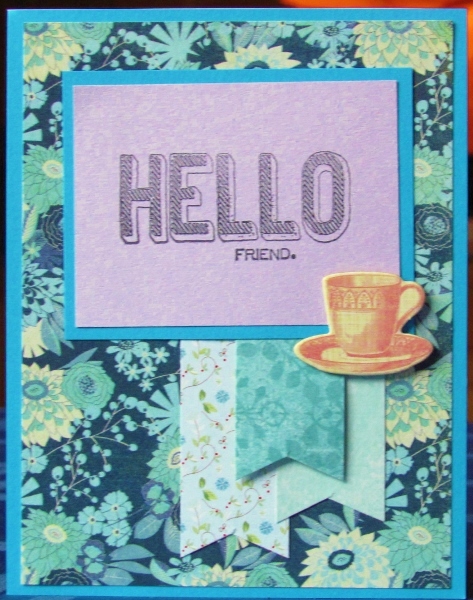 On this version the use of a busy floral background is echoed in the chipboard embellishment in theme and color. 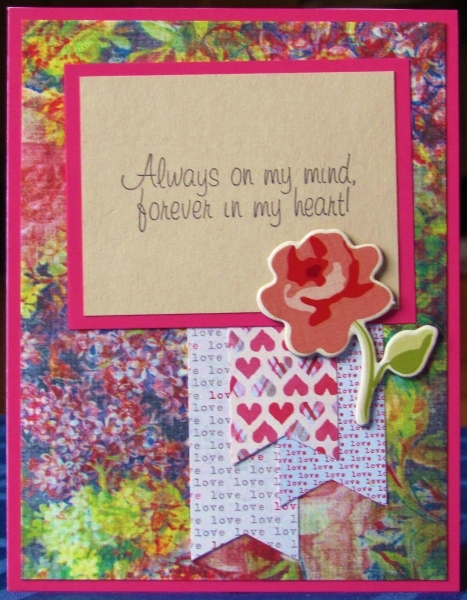 I keyed off the sentiment to choose papers for the flags, using hearts and 'love' text. The raspberry bordering matches some of the hearts and focuses the attention on the kraft sentiment panel. 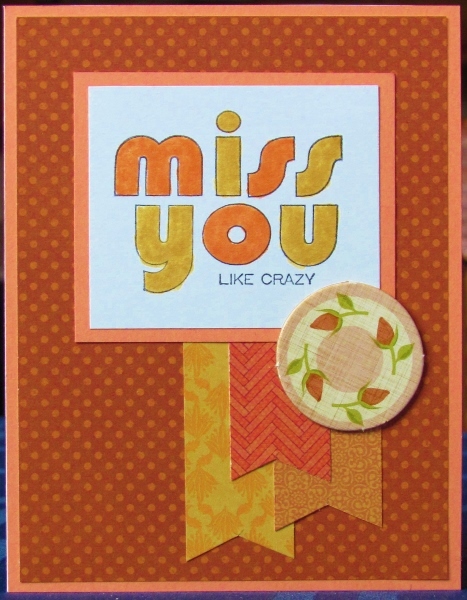 When I had a sentiment stamped on white cardstock it gave me a lot more flexibility in choosing papers to use in the design. I chose the flags first and then, instead of heading down the teal path as expected, I took that single red line on the striped flag and used it as the key to all the other elements. I love the red dot paper which I matched in the bordering. The red also spoke to the selection of an embellishment. Lest the sentiment look too plain, I added a red line border all around it. Today's version has a much cleaner look than yesterday's. This is predominantly due to the main background with its widely spaced large dots. I started out with a different pattern but when I turned the page over to apply the glue, this was the back of it. I liked it a lot better than the original choice. The sentiment panel is very simple as well with that single word in script. The three blue flags are dark, medium and light giving them good contrast and I used foam tape under the lower edge of the top one. 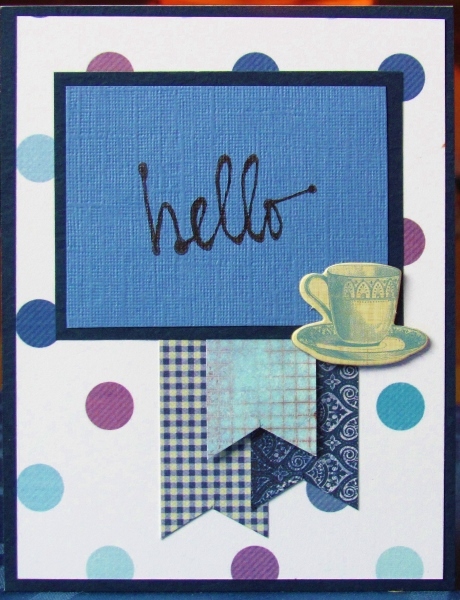 The chipboard embellishment used on this one is a blue teacup. Although I started with a lavender sentiment panel the use of this color in the remaining elements is very subtle. I went with a blue floral in a very busy print along with a pink teacup embellishment. Teal bordering gives a bold look. The bottom edge of the center flag is raised on foam tape to separate it from the other elements.